We received the following correspondence from Adrian O’Connor, who swam in the 1996 Olympic Games in Atlanta. “Thanks for your email, I really enjoyed the gala; it was exactly what I needed – a good variety of tough well run races to get me back in line. I thought the challenge was a brilliant idea and it’s lovely to have received a prize, it’s much appreciated. As part of our on-going support for clubs and members we will be holding workshops in each region to support and foster the relationship between coaches and committees. As one of the most important relationships within a club setting, we want to allow the opportunity for coaches and committees to come together and discuss the key areas to make sure this relationship delivers for the club. The workshop is free and all participants will receive a unique gift pack and lunch and refreshments will be provided. Further details to follow in due course. Our sincere apologies but following a committee meeting this evening, a decision was taken to postpone our upcoming Gala on the 24th March due to the late notification of renovation works at the Sean Treacy Memorial Pool and the related health and safety concerns. We appreciate that this will cause inconvenience to many clubs but unfortunately this is outside of our control. We hope to reschedule the gala to run on a different date in the next few weeks and will advise of the date as soon as we can confirm same. We would like to thank you for your invaluable support to date and look forward to seeing your club at our rescheduled gala, if you are still in a position to attend. SWSC travelled to the Munster Devolopment level 2 Meet yesterday 2nd March with a total of 16 Swimmers to compete in 100 and 200 Events in all strokes. For some of these swimmers it was their first time competing in these events and we as a Club were very proud of them as Nerves were overcome and some stand out Swims achieved , PBS galore and between them 9 Gold Medals ,6 Silver and 2 bronze Medals came home. Well done to you all again and thanks to Iryna for managing them all day and of course to the parents who were officials on the day we could not do it without your help. Biannually, all member nations are invited to submit the names of National Referees for consideration to the FINA List. Selection to the FINA List is the highest recognition conveyed on a Referee. On the Swim Ireland Official Pathway, FINA Referees attain a Level 5 qualification. Commitment and performance at SI competitions. Experience gained at home and at meets in the UK. 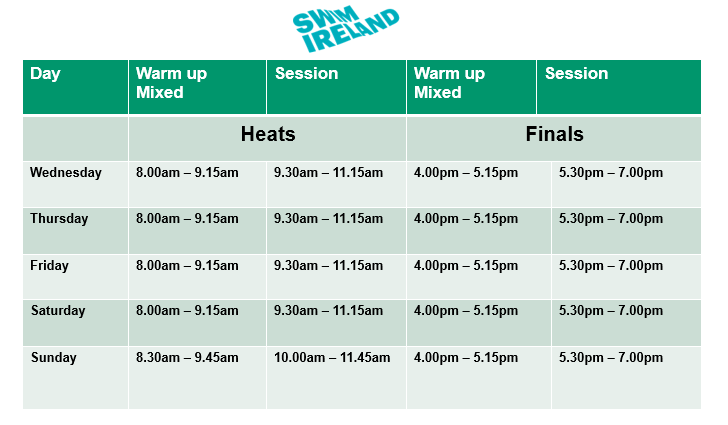 Delivery of professional standards at all level meets within the Swim Ireland competition programme. To be in line for consideration, one must have served as a National Referee and been the Lead Referee for a minimum of one National Championship Meet. Served for a period on the Pre-FINA List gaining experience of working at meets in the UK. 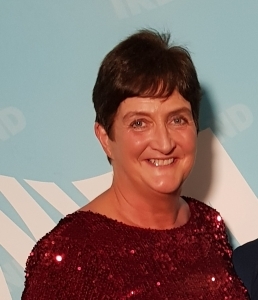 We are delighted to announce that Club Member, Mary Haughney was accepted on to the FINA List #20 which came into effect on 1st January 2019 and will remain effective until 31st December 2022. Referees, Starters, Judges of Stroke and Inspector of Turns for all European, Junior & Senior, World Junior & Senior and potentially the Olympic Games are selected from this panel of Referees & Starters. Mary first began officiating when her children were swimming with the club (early 2000) and progressed up through the ranks, becoming a National Referee in 2013. She has been Referee at numerous Club, Regional and National events and was the Lead Referee at IAGDiv2 2017, Irish Open 2018 and Irish Short Course 2018. She was worked at international meets in Swansea, Manchester and Berlin. In addition, Mary is a SI Mentor and Assessor to Officials, and is the SI Regional Lead for the development of Officials in the Munster. She is a SI Officials Tutor and delivers Level 1 & 2 Official Courses. This is a tremendous honour for Mary and for our Club and we wish her success in her new role. The Club Development Day will focus on the Coach/Committee relationship and will be integral to help us identify supports we can offer and to formulate up a partnership agreement which clubs can individually tailor as circumstances are unique. These workshops are free and interactive so I would ask that clubs engage with these and have as many coach and committee members attend. They can book directly on the links below. The results to our recent Masters Gala can now be found on the Masters Events & Results Page.